Great to be home but .. I couldn’t help but be really pleased to see the Dean wearing a business suit and making shoes showing you know. But I think we can all be and we can all be glad that basically I was not the founder of jocky underwear. Well we’ll try and make that a permanent change in the leavens wardrobe. Now Phil we know you don’t do too many public speaking events. 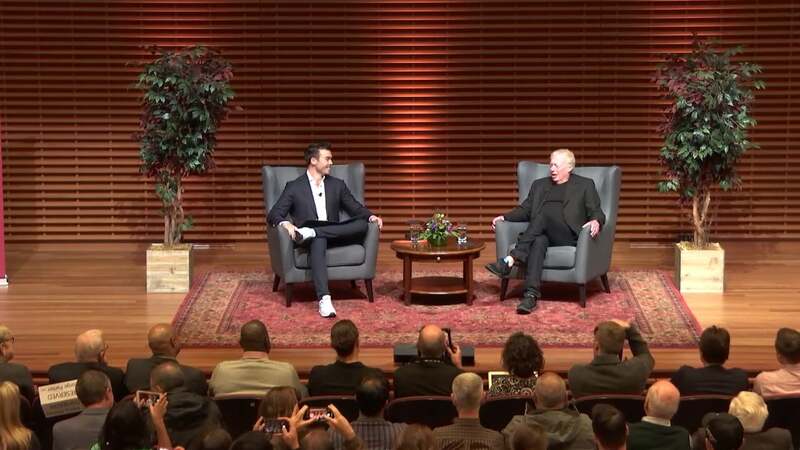 A question a lot of people have asked is What does it take to get Phil Knight up on stage. So I thought maybe we should share the story of what got you here today. Now you probably remember that we first crossed paths a couple of months ago just over there MICK MCDONALD Hall. You were entering the building when I very politely interrupted you introduce myself. We exchanged a couple of pleasantries and then you went on inside about your day. Now what you’re probably less aware of Phil. Is that I decided to camp outside MacDonald Hall for the next 40 minutes watching every possible human exit to the building so that I could find you and you know casually bump into you a second time to Pichi this interview. It’s creepy. I don’t know. That that’s how it happened. I’ll be honest I was pretty nervous when you did come out at that second time it was fight or flight. I very nearly walked the other way but there was this voice in my head it just kept saying we’ll just do it. Borrelli really we are so thrilled and excited to have you back on campus and I think I speak for every student here when I say how grateful we are for this incredible business school. Well thank you. But you know having stopped me for at least 40 minutes. I feel that there should be some payback. And I know that most of you know that Will’s mother Maggs has come all the way from Ireland to be here today. And. Having. Come such a long way I think you should reveal something about yourself that she doesn’t know. So I don’t know what you’re trying to suggest. I was a perfect child. Did you make your bed this morning. I didn’t even sleep in my own bed this morning because I gave my whole. Given time. That wasn’t what it sounded like. All right. Now Phil. Phil, we don’t want to make you feel old. This is payback by the way. This could go back and forth a long time. But it’s been almost 60 years since you were here in our shoes. An incoming MBA class of 1962. What kind of person was Phil Knight. Back in the GSB. How would you describe yourself. Yeah I will. But I want to tell you first about coming back to campus after being gone for a while. That you go out 20 years or so and Yemen back for a while and you come back and it’s more about just sharing a moment with family and friends. It’s for a moment you step back in history and remember. When you had all the world laying out before you and you cited the things that you were going to find important it was really the start of you becoming what you ultimately became. When I come back. For just a moment I’ll always hear the voice of Frank Schellenberger Bob Davis. Jim Porterfield and I know that sounds corny to educated group. But I promise you that over half the people in this room when they come back here 20 years from now will have those same feelings. You know for me you know it was while yeah that I was the guy. That thought an extrovert was the person that stared at other people’s shoes. The the. It was a time for me to kind of grow and chase what I was really gonna become. And so it was really a big transitional period for me in my life. And as I say to this day when I come back I still get inspired and lifted up. Giovanni favorite memories from your days back at Stanford. Oh that. No it was just a turning point in general for me that you know if I was honest I’d say that my undergraduate career with really. The post Phil Knight, Co-Founder And Chairman Emeritus, Nike appeared first on ValueWalk. This entry was posted on Monday, February 11th, 2019 at 1:01 am and is filed under Immediately available to public, ValueWalk. You can leave a response, or trackback from your own site.